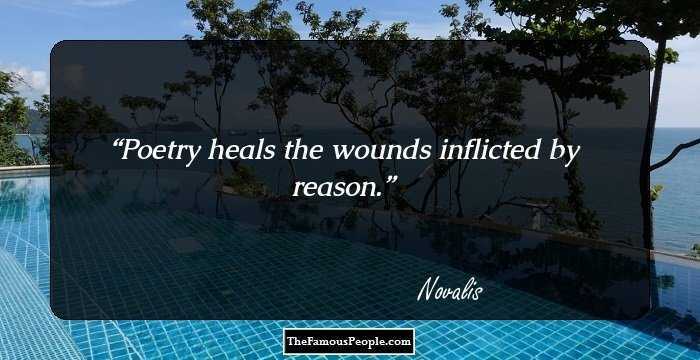 A collection of quotes by Novalis on philosophy, poetry, healing, nostalgia, life, love, romance, artist, pain, inspiration, genius, morality and humanity. 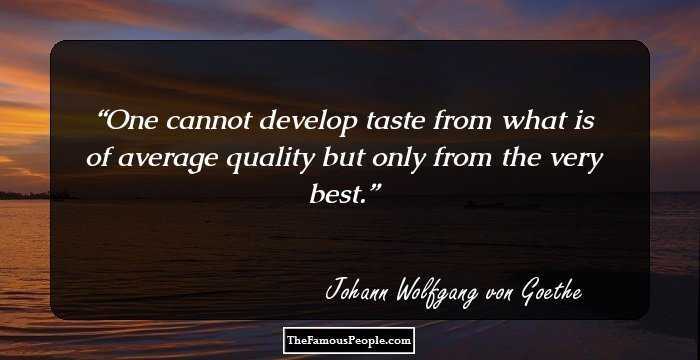 Georg Philipp Friedrich Freiherr von Hardenberg, popularly known by his pen name Novalis, was a German philosopher, author, poet and mystic. He rose to prominence in the 18th century and is regarded as the most important figure in Early German Romanticism. 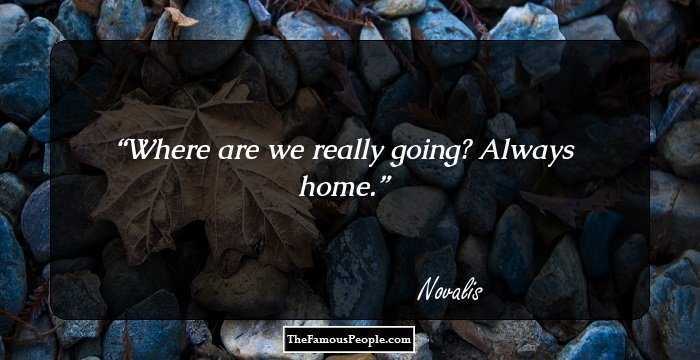 Novalis was born in an aristocratic family, studied law and then went on to study geology at the Mining Academy of Freiburg. 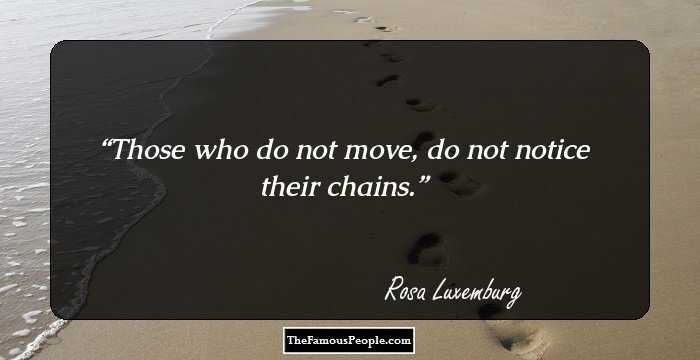 Although he had been trained in geology and law, he made his name as an author and philosopher. 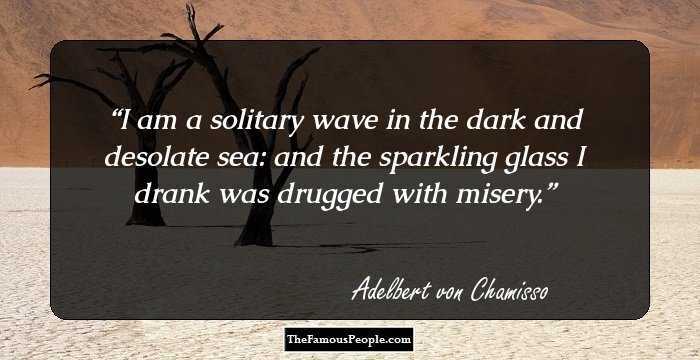 He maintained note books and wrote several philosophical books during his life, which came to be broadly associated with Early German Romanticism. Some of his noted works include ‘The Birth of Novalis’, ‘Hymns to the Nights’, ‘Classic and Romantic German Aesthetics’, ‘Fichte Studies’, ‘Novalis: Notes for Romantic Encyclopaedia’, ‘Novalis: Philosophical Writings’ and ‘The Novices of Sais’ etc. 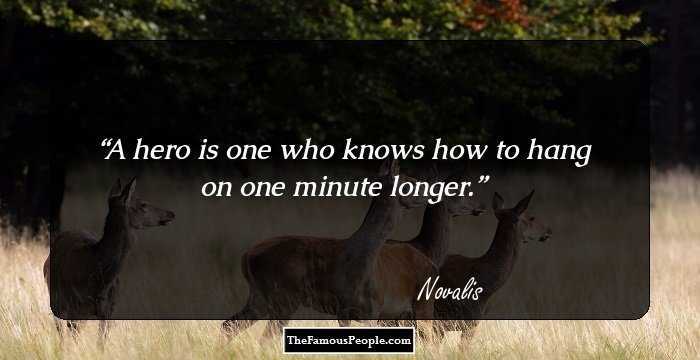 Many of Novalis’ work have been translated into English by scholars from all across the world and his works are housed in some of the leading libraries. 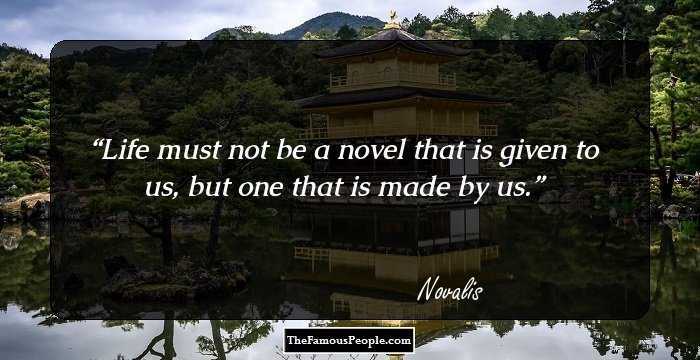 Here is a collection of quotes and thoughts that have been extracted from the vast sea of writings, novels, books and poems by Novalis. 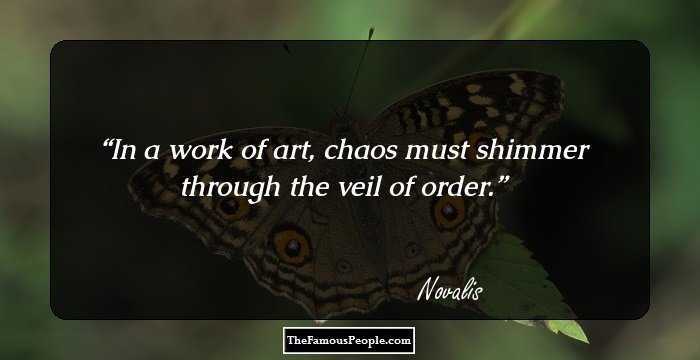 Go through the profound sayings, thoughts and quotes from Novalis’s work and life. Where are we really going? Always home. 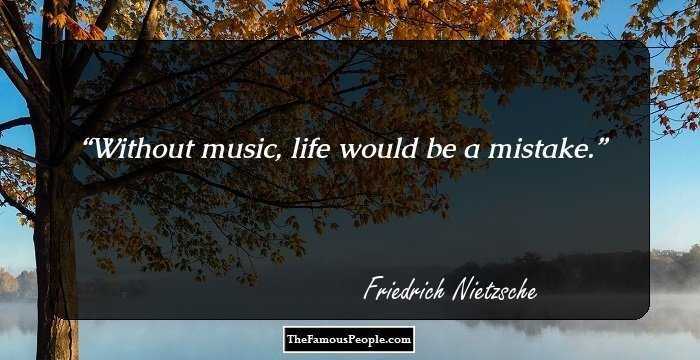 Every disease is a musical problem; every cure is a musical solution. One should, when overwhelmed by the shadow of a giant, move aside and see if the colossal shadow isn't merely that of a pygmy blocking out the sun. We are close to waking when we dream that we are dreaming. To philosophize means to make vivid. Philosophy is really homesickness: the urge to be at home everywhere. Humanity is the higher meaning of our planet, the nerve that connects this part of it with the upper world, the eye it raises to heaven. Genius in general is poetic. 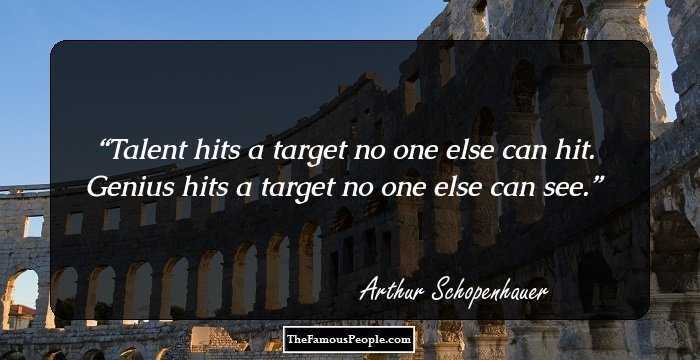 Where genius has been active it has been poetically active. The truly moral person is a poet. Every individual is the center of a system of emanation. There is an energy which springs from sickness and debility: it has a more powerful effect than the real, but, sadly, expires in an even greater infirmity. But even more heavenly than the flashing stars are those infinite eyes which the night opens within us, and which see further even than the palest of those innumerable hosts. Wer Schmetterlinge lachen h�rt, der wei� wie Wolken schmecken. And now I awaken, for I am both yours and mine. Longing for Death Down into the womb of the earth, Out of the kingdom of light, Anger, pain, and a savage blow Signal the happy departure. Whoever sees life other than as a self-destroying illusion is himself still preoccupied with life. Life must not be a novel that is given to us, but one that is made by us. The process of history is combustion. What delights, what pleasures does your life offer you that outweigh the raptures of death? Up to now our thinking was either purely mechanical - discursive - atomistic - or purely intuitive - dynamic. Perhaps now the time for union has come? Light had its allotted time; but timeless and infinite is the reign of the night − the duration of sleep eternal. 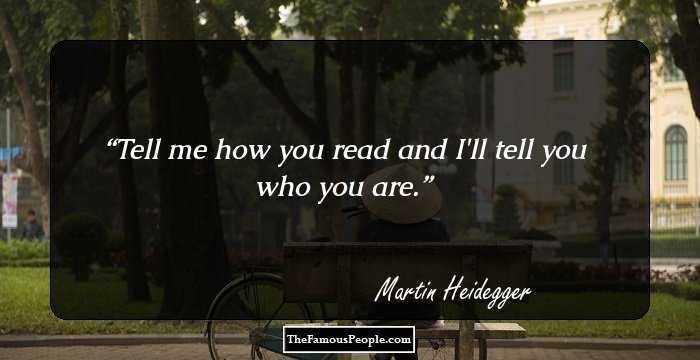 I show that I have understood a writer only when I can act in his spirit, when, without constricting his individuality, I can translate him and change him in diverse ways. Ohne die Tr�ume w�rden wir gewiss fr�her alt. The most intimate community of all knowledge—the republic of learning is the high purpose of scholars. Many books are longer than they seem. They have indeed no end. The boredom that they cause is truly absolute and infinite. I live all the daytime In faith and in might And in holy fire I die every night. 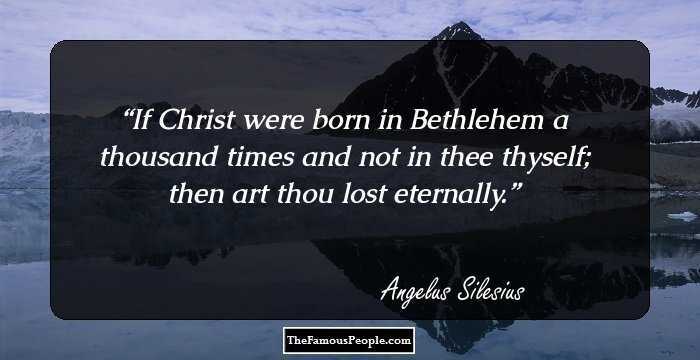 One makes a great error if one believes there are 'ancients.' Only now is antiquity starting to arise. It arises in the eyes and soul of the artist. Holy sleep, do not so seldom bring happiness to the night’s beloved in this earthly labour of the day. Flight from the communal spirit is death! Doing philosophy is only a threefold or double kind of waking--being awake--consciousness. Novels arise out of the shortcoings of history. The greatest of sorcerers would be the one who would cast a spell on himself to the degree of taking his own phantasmagoria for autonomous apparitions. 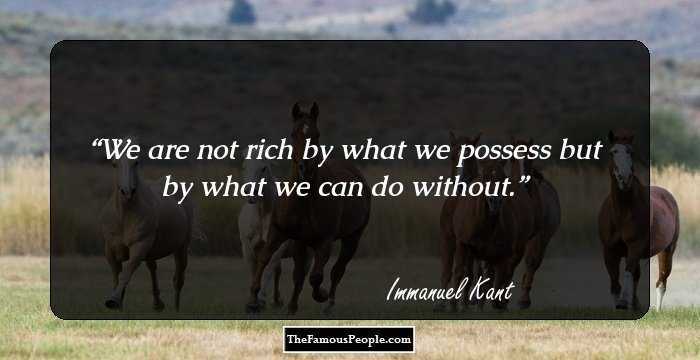 Might that not be our case?